you download the application form. WHAT IS A STUD PREFIX? One thing you need to be aware of is that your stud prefix is for the life of your involvement in the Cavy Fancy. A Stud Prefix is NOT a Stud Name, you can name your stud whatever you like. A Prefix is the name (word/number depending on what is registered) that goes 'before' the name you give any cavy born at your stud. A prefix is very important in the fancy as it is what other members in the fancy recognise your cavies by for breeding and exhibiting purposes and for writing on pedigrees. At this stage in the rules, no one else can use it while you have it registered. Think carefully how you want to be seen as a breeder and exhibitor, your Stud Prefix can say a lot. Show Secretaries need to use the FULL name (Prefix AND Given) for accurate club records! 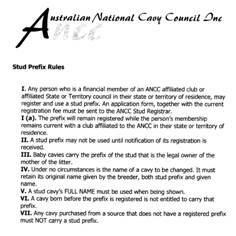 Once a Stud Prefix is allocated to a cavy YOU bred then that is the name for Exhibiting, on selling and breeding purposes. the lineage info of the cavy that is required on an accurate pedigree form. There are certain rules (available on this page and HERE on this website) about the registering and use of a Prefix. Similar names to current registered Prefixes will NOT be approved. Offensive names, either in spelling or phonetically, will also NOT be approved. Any cavies born PRIOR to the date of Registration may NOT carry your Prefix. You cannot change a cavies Prefix or give it YOUR Prefix if it was born outside your stud and you do not own the dam. 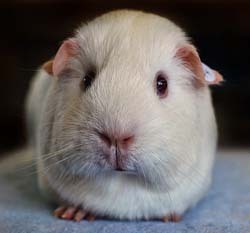 You call a cavy born at your stud, to a dam that you legally own, "Fluffy"
This cavies FULL NAME for life is ANDINO FLUFFY. Andino is the important part of the name, it recognises the Breeder. Whether you sell or keep this cavy it MUST carry the Prefix of its place of birth for the cavies life. Can I have MORE than one Prefix? Adobe(R) Reader(R) is required to read all documents. Get it for free from the Adobe website. Additional information about the Active Stud List. Please allow time for new applicants to be added to the list. It is only a list of Members and their stud names who are currently financial members of ANCC clubs. These Members are considered active and can use the "Term" ANCC registered stud. Please note; All registered studs, past and future, will be included in the National Stud List, which will be available for download from this web site. This list will include information pertaining to each stud registered in Australia, including the Stud Name registered, the stud owner's name(s), and the state in which the stud owner resides. All hard copy prefix applications will be destroyed after 2 years. Stud Prefixes are limited to 15 characters long, INCLUDING SPACES. To speed up the application process,a current club membership receipt can be sent with your application and Fee.This will make the confirmation process faster and your membership receipt will be returned with Stud Prefix Certificate. 2. Forward the completed application to the ANCC Stud registrar along with your club membership receipt as well as a cheque or postal note for the registration fee. 1. 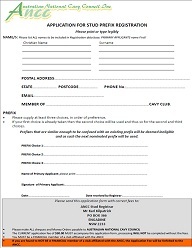 Download the application form from the ANCC website and fill in the details, then make a scanned copy. 2. Make a scanned copy of your club membership receipt. 3. Make a direct deposit of the application fee into the Commonwealth Bank - Australian National Cavy Club BSB 064439, Acc No: 10318985 and use “Rego” as the reference and make an electronic copy of the transaction receipt. Applications are to be on the above ANCC form only. Applications on any other form will be returned.